These apples are hollowed to the shape of a volcano so they take more stuffing, hence their name in our family. For the filling, I’m calling for muesli as it is so easy to find, but you’ll save a bit of time if you use granola, which is already toasted. Simply mix it with the other ingredients. You’ll need a tart variety of apple that will be fluffy and juicy when baked; traditional favorites are Rome Beauty or McIntosh (Cox’s or Reine de Reinettes in theUK), though you can always fall back on the ubiquitous Granny Smith. 1. Heat the oven to 190ºC/375ºF/Gas 5. Wash and core the apples, scooping out a hollow in the top to hold the filling. Slash the skin of each apple horizontally around its equator so the flesh can expand without bursting the skin. 2. Melt the butter in a non stick frying pan and add the muesli, walnuts, and brown sugar. Toast 3-5 minutes, stirring constantly, until the muesli starts to brown. Remove from the heat and stir in the cinnamon. Set the apples in a shallow baking dish; they should not quite touch each other in the dish so heat can circulate. 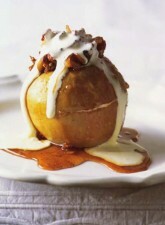 Push some of the mixture into the hollow of each apple, mounding it on top, and pour a spoonful of honey over each one. 3. Bake the apples, basting occasionally so the honey forms a glaze, until they are tender when pierced with a skewer, 40-50 minutes. Towards the end of cooking, keep an eye on the dish and add a little water if the honey shows signs of scorching. 4. Serve the apples hot, with the honey syrup spooned over as a sauce. 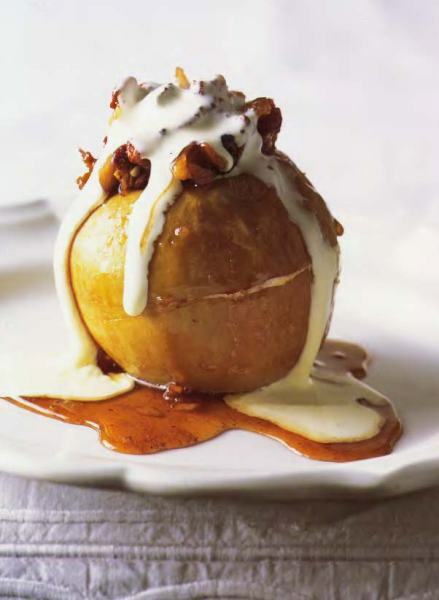 Getting Ahead: Baked apples are pretty good baked ahead, then reheated gently in the oven. They will keep in the refrigerator up to 2 days. On the Side: Ice cream, yogurt, or a pitcher of the richest heavy cream you can find. In the Glass: Let’s have more apple with a mug of cider.